One of the items of feedback from my tutor has been to try dyeing my own fabrics so I decided to try out a new method to me and to create some marbled fabric. 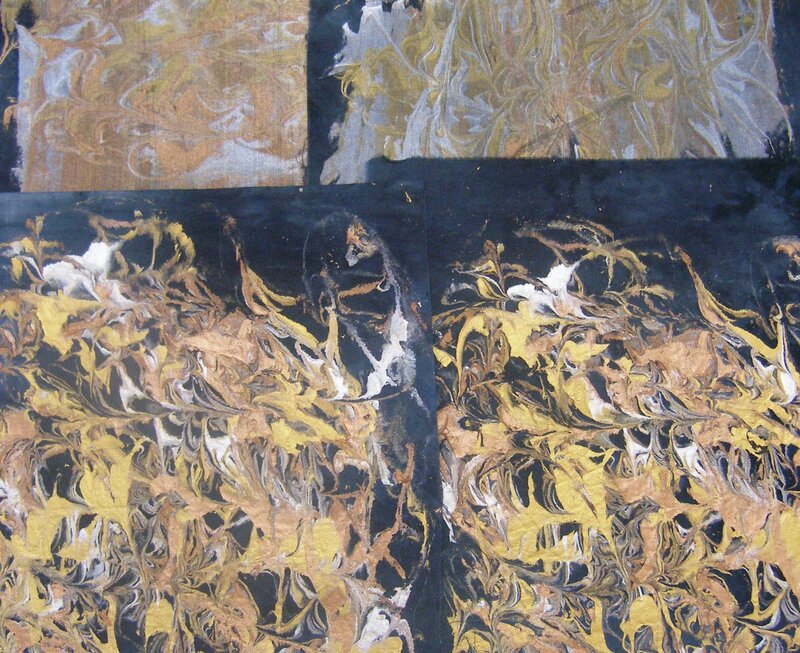 The basic method is the same as for marbling paper, where the paint is floated on a liquid base and then then paint is formed into different designs by use of pointed sticks, either a single skewer can be used or a common method is to create a comb or rake by hammering nails into pieces of wood. For working on fabric I used the shaving foam method as per this video on You Tube from Sea Lemon. I filled a tray with shaving foam, smoothed the surface and then put splatters of fabric paint on top. 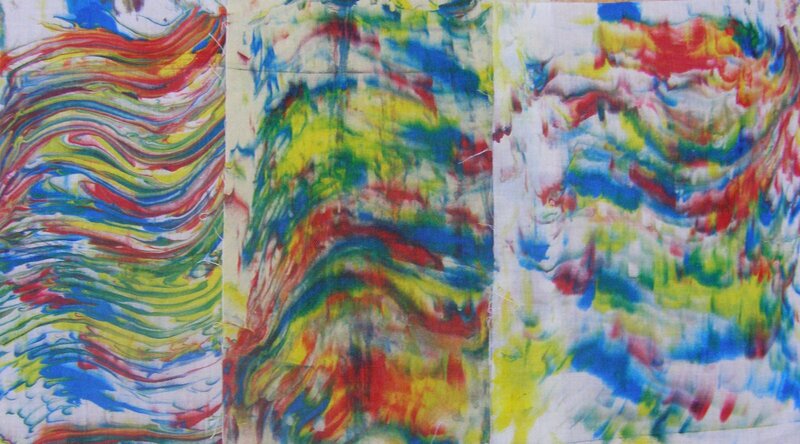 The paints were moved around with a skewer to form patterns and then fabric was gently pressed onto the surface. After lifting the fabric, the excess shaving foam/paint mixture was scraped off the surface of the fabric and it was left to dry. I then rinsed the fabric lightly to remove excess foam before ironing to set the colours. 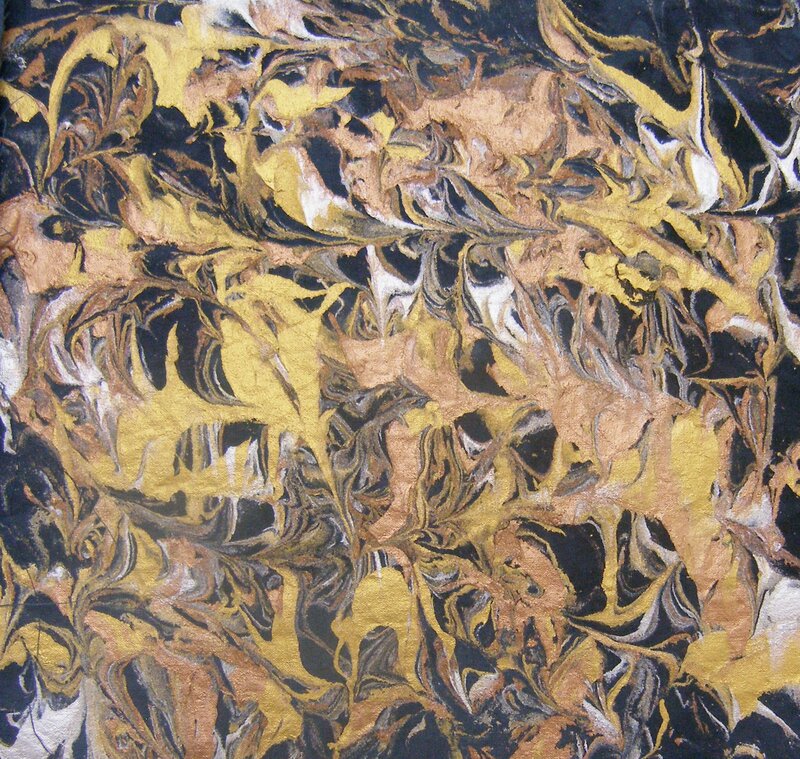 This first photo shows metallic paints on black fabric. With the top two fabrics the shaving foam was scraped off as per the standard method but I did not like the way this smudged the whitish pearl lustre paint through the other colours. The result is still effective but it is not what I was after. So for the next two pieces, in the bottom part of the photo, I left the foam on overnight and then rinsed it off in the morning. The print is much clearer and the marbled swirls more defined, allowing bits of the black fabric to show through which was what I wanted. The next photo is of primary colours on white fabric, 3 prints from the one lot of colour/foam so they reduce in intensity. 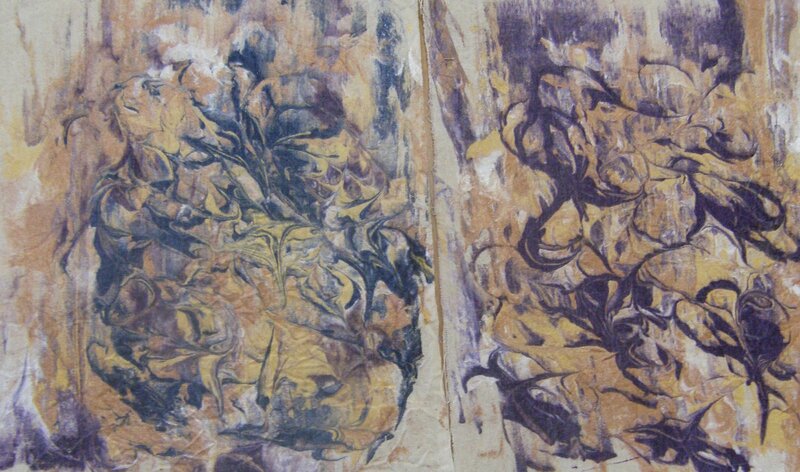 The last examples are on white fabric, with a very smudged metallics base topped with blobs of navy and grape that were then lightly swirled. The results are lovely and I can see me using this technique to produce more colours schemes for backgrounds or applique details.